Jack Bark grew up in a household obsessed. His father Joe Bark, the legendary waterman and founder of Bark Paddleboards, taught him the beauty of the ocean at an early age. Now, 20-year-old Jack has become a legendary paddleboarder himself, conquering races across the globe while passing competitors atop his family’s boards. Instead of picking up a soccer ball or baseball like most of his classmates, Jack picked up a paddleboard. Since starting competitive prone paddleboarding, Jack has finished third in the 2012 Catalina Classic stock division, first in the 2012 Molokai 2 Oahu stock division, second in the 2013 Molokai 2 Oahu stock division, first in the 2014 Malibu Downwinder and first in the 2014 Carolina Cup. 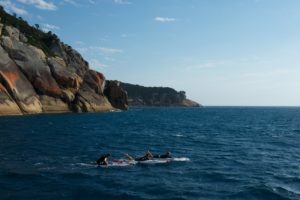 In late February, he tackled the Bass Strait, a 190-mile stretch from Australia to Tasmania, in six days with fellow competitive paddle boarders Brad Gaul and Zeb Walsh. The Strait’s shallow waters – typically 30 to 50-metres deep – combine with changing currents and high winds to produce large swells.. 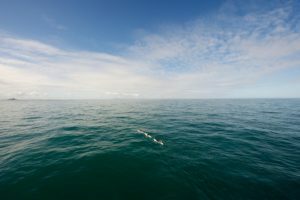 The trio paddled 25 to 40 miles a day and were followed by a support boat, carrying a camera crew. They spent nights on islands dotted along the route. Paddleboarding excursions usually last a few hours or at most, a day. This time, he was paddling almost continuously for six days straight, with only a night of rest in between. Bark took a semester sabbatical from his sophomore year at California State Dominguez Hills to undertake the adventure. Since coming home, he has spent his time either in the water or helping his father shape boards. Bark said he never felt forced by his father to join the family business. He plans on continuing to paddle in races across the globe as well as help his father in the Bark Paddleboards shop.